Welcome to our very first Masterclass! It's the beginning of the week, our brains are refreshed from the weekend and we're ready to learn. What better time to kick off some jewellery education! Jewellucation? Whatever you want to call it, let's start our first masterclass with a girl's best friend - the beautiful diamond. So we all know it's shiny, it's stunning... What else? A lot of work goes into making that rock the gorgeous accessory you see on your finger. There are actually four characteristics that make each diamond unique; the four C's. These are cut, colour, clarity and carat weight. The combination of the four C's determines the value of a diamond. While diamonds come in different shapes (like round, pear, etc) the term “cut” actually refers to the diamond's proportion. A diamond's cut determines its light reflection - its sparkle factor. When a diamond is cut to the right proportion - neither too deep nor too shallow - the light will reflect inside the stone from one mirror-like facet to another and reappear through the top, making it sparkle from within. So the cut affects how "shiny" your diamond is. 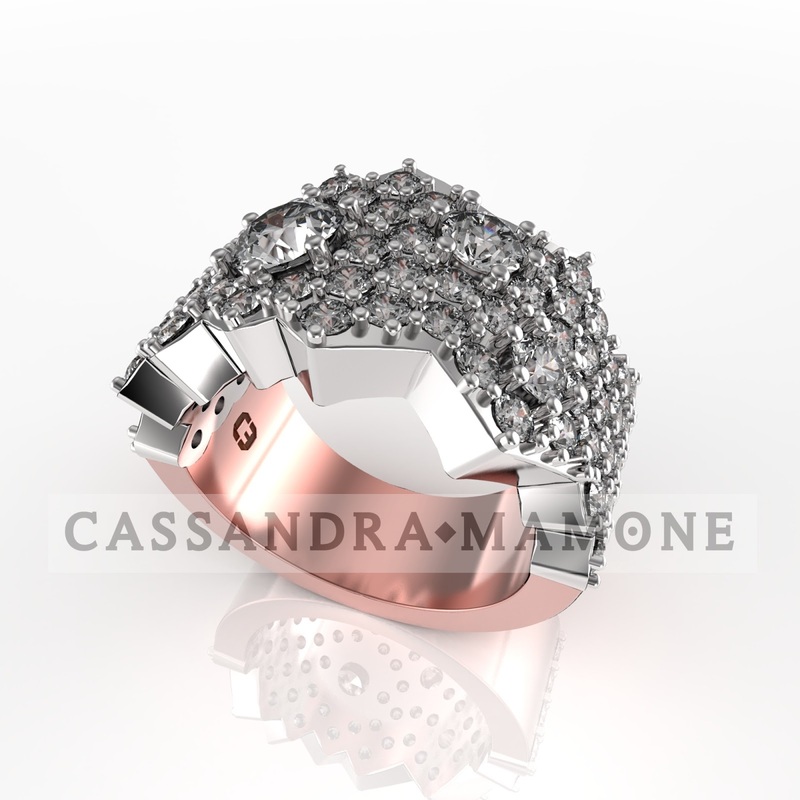 Cassandra Mamone selects colourless diamonds from the top three colour grades only: D, E, and F. These are the rarest and so the most valuable. Fancy coloured diamonds are an exception, and are lusted over due to their extreme rarity. The quality of these diamonds is judged by the intensity of their hue (think pink, blue, yellow). Unlike white diamonds, the more colour, the rarer the diamond. Diamonds were formed millions of years ago, deep within the earth under enormous heat and pressure. As a result, most diamonds contain tiny marks known as inclusions which make each stone unique, like a birthmark. 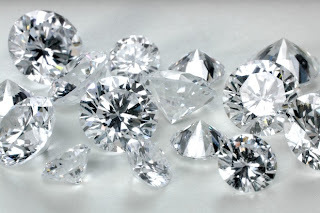 Nearly all diamonds contain these unique clarity characteristics. When viewed under magnification they look like tiny crystals, clouds or feathers. Diamonds with no inclusions are categorised either as flawless (FL) or internally flawless (IF). It's no surprise that these diamonds are exceptional and costly. The inclusions don't necessarily weaken the stone and, as long as they don't interfere with the passage of light, they won't affect its beauty either. The fewer and smaller the inclusions, the more valuable a diamond will be. And finally, the carat. We've all heard of one or two carat diamonds, but what exactly does it mean? Well, a diamond's size is measured in carat weight, and one carat is equal to 0.20 of a gram (or one-fifth). Each carat is divided into 100 points, so a diamond of 50 points weighs 0.50 carats. Congratulations! You've just survived your first Diamond Masterclass and you now know the crucial elements which come together to form stunning diamond jewellery like the one below. 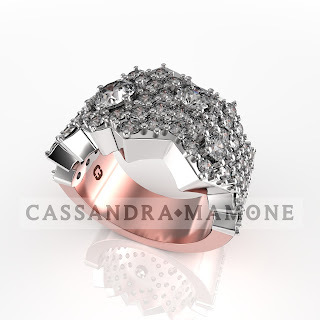 - in total it's approx 2.84 carats. The ring is 18 carat white and rose gold. Now you may have a greater appreciation for that ring on your finger, or you may impress your friends at the dinner table... But most importantly, you may be starting to understand why at Cassandra Mamone we're so passionate about a beautiful little rock!